Shelley Danner joined Challenge Detroit in 2012. As program director, she designs and oversees programmatic aspects of the multi-faceted, innovative fellowship model and supports strategic planning, partnerships and operations for the organization. In particular, Shelley coaches and guides the leadership development of the Fellows training them in design thinking principles, and scopes the challenge projects in collaboration with nonprofit partners. Prior to joining the Challenge Detroit leadership team, Shelley spent seven years in Washington, DC as a consultant with Accenture, a global technology and management-consulting firm. Her background includes talent and leadership development, strategy, organizational transformation, project management, and human-centered design. During her time at Accenture, Shelley worked with a variety of clients in both the public and private sectors, primarily in talent and organization performance. She helped support the launch of Accenture’s North American non-profit consulting practice and worked with Accenture’s corporate citizenship team to implement a national skills-based volunteering program for employees. Shelley is a 2011 Social Innovation Fellow through Starting Bloc, a 2014 Marjorie S. Fisher Fellow, a 2016 IDEO U Impact House Fellow, and a 2016 delegate to the Salzburg Global Seminar for Young Cultural Innovators. 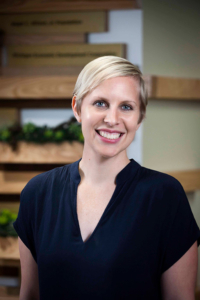 Shelley is also a facilitator and coach who is immersed in the innovation and social enterprise landscape in the city, and has given workshops and talks at institutions locally and nationally including American University, University of San Diego, Wayne State University, and University of Michigan. Shelley is passionate about design thinking, education and leadership, sustainable cities, the arts, and travel. Shelley holds a Bachelor of Science degree in Business from Miami University in Ohio and has completed a leadership coaching graduate certificate through the Institute of Transformational Leadership at Georgetown University.